Godrej & Boyce, part of the diversified Godrej Group, is experimenting with digital technology such as augmented reality (AR) to scale up the market reach for its premium furniture and accessories brand, Script. The brand is currently under a purely brick-and-mortar domain. Since launch in late 2017, it has limited itself to only the Delhi region and Bengaluru, with showrooms typically occupying a 10,000 sq ft space. It is now coming up with a smaller, 1,500 sq ft showroom (boutique) in Mumbai, powered with AR. AR, one is told, will offer visitors an interactive experience by superimposing products into an image of the visitor’s view of the real world. Visitors might be able to visually perceive how their room or space will look, once an item of furniture or accessory from Script is placed. “If this model (small showroom format, backed by modern digital technology) succeeds, then we will plan to have such boutique formats in malls and airports in metro cities,” Rajat Mathur, business head of Script at Godrej & Boyce, told Business Standard. If a success, the technology might be extended to other showrooms. Upscale malls such as Quest in Kolkata, Palladium in Mumbai, Select Citywalk in Delhi and others, beside the airports in metro cities, will then be considered. Mathur says other furniture brands, including Godrej Interio, have a functional design. Script is based on an experiential model, catering to a contemporary lifestyle. Godrej’s objective is to position Script as an “aspirational brand”. This requires a more “premium customer experience in its showrooms”. Hence, initially, the company haddecided to first have large-format stores to showcase products and then opt for boutique formats. 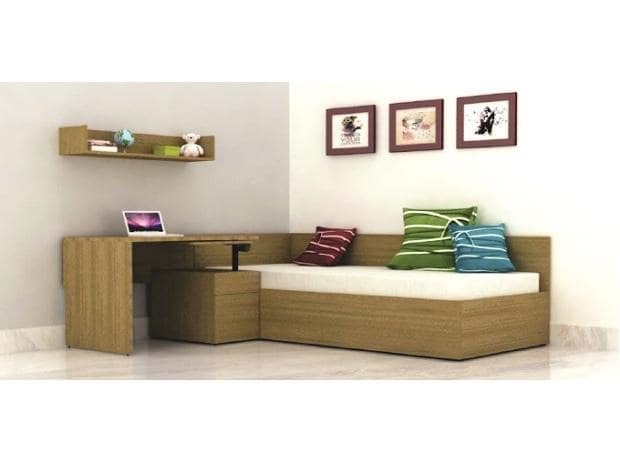 Typically, Script furniture is priced 30-40 per cent higher than Godrej Interio. In the Rs 50,000 crore furniture market, Interio operates in the mid-range space, a Rs 30,000 crore opportunity. Script will operate only in the premium space, pegged at Rs 10,000 crore. Around 80 per cent of the total furniture market is in the unorganised sector. Six more such big stores are already invarious stages of completion, across the Delhi region, Mumbai, Kolkata and Hyderabad.